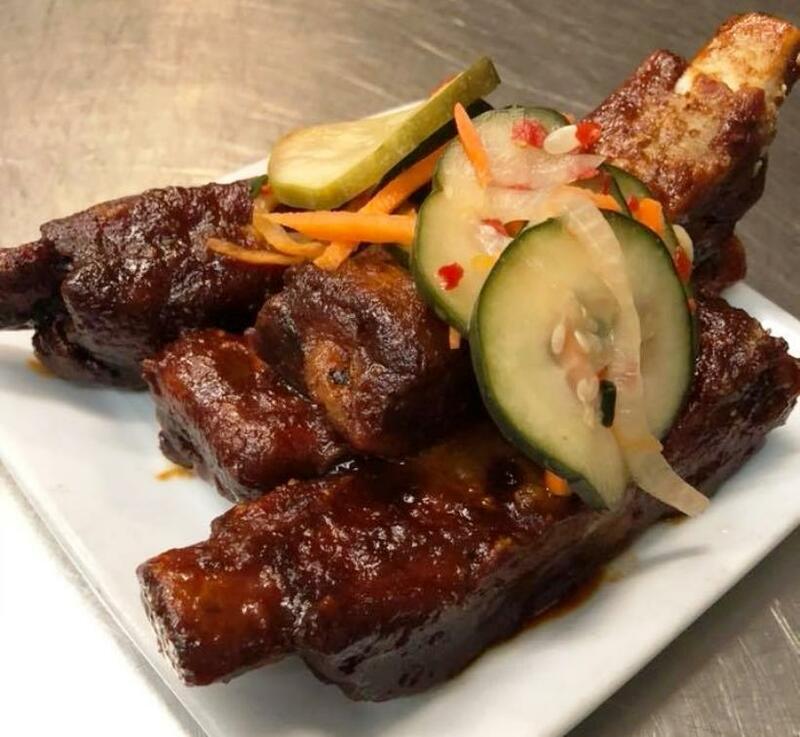 Crispy Korean BBQ ribs can be ordered as an appetizer. WHO’S IN CHARGE To the chef and owner of Fuse Westford, farm-to-table is much more than a concept. It’s a way of life. In his younger days, Scott Pelletier spent a lot of time on his grandparents’ farm in Stratham, N.H., where they grew their own food. He recalls how his grandmother, Mimi, would use freshly butchered meat and newly harvested fruit and veggies to craft scrumptious homemade meals in her kitchen. At his new Westford restaurant, which opened in September, he grows his own herbs. When he drives to work from his home in Methuen, he goes by Farmer Dave’s in Dracut, where he picks up fresh produce (yellow and purple carrots; butternut squash; spaghetti squash; red kuri squash; purple kohlrabi). He buys his apples from Hill Orchard Farm in Westford (which is also run by Farmer Dave) and gets ducks, chickens, and organic greens from Herb Hill farm in Pepperell. He takes pride in the fact that so much of the food at Fuse – from the chipotle ketchup to the mayonnaise to the focaccia bread – is made in-house. One of the few things that aren’t is the burger buns, which he gets from a Portuguese bakery in Lowell. “My food is a fusion of American, French technique, and Asian influences from my time in San Francisco, and we infuse all of our house cocktails ourselves, hence the name ‘Fuse,’” Pelletier said. THE LOCALE This is Pelletier’s second Fuse location. His flagship restaurant is located in a converted firehouse in downtown Lowell. When he decided to open a second Fuse, he chose a choice spot at 2 Powers Road in Westford. Located near the intersection of Route 110, Fuse Westford feels tucked away but is only minutes from Interstate 495. 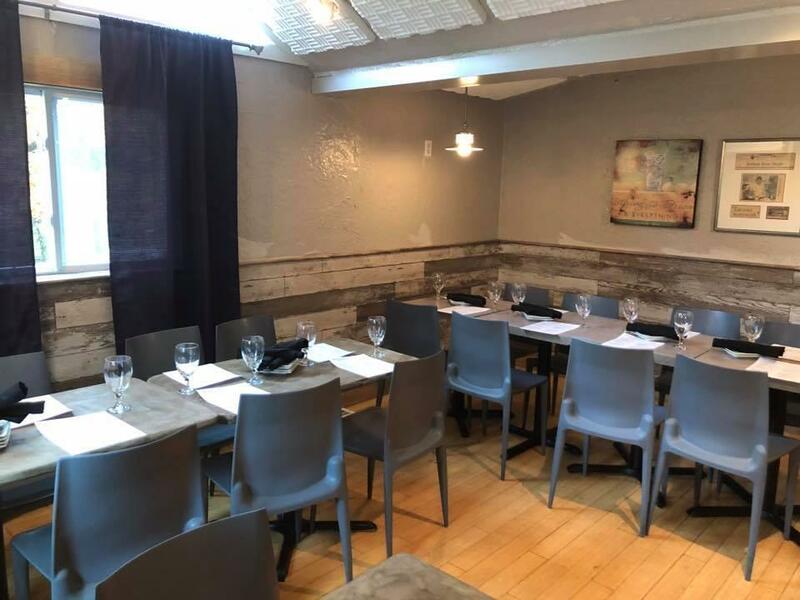 Inside, the 65-seat restaurant includes a full bar with about a half-dozen seats. The interior décor is farmhouse industrial chic, and the atmosphere is calm, cozy, and quiet. Perfect for a date or an intimate gathering of family and friends. The offerings are seasonal and change often. Creamy cauliflower soup ($6), housemade pasta ($22), and grilled grass-fed rib eye ($27) were among the specials offered on the evening that I visited. One of my favorite dishes is the thin crust pizza ($11), which is made with Parmesan-Reggiano cheese, house-pulled mozzarella, red sauce, fresh basil, and tomatoes. If you’re feeling more adventurous, try the short rib pizza ($17) topped with truffle fondue sauce, smoked cheddar, baby arugula, and grilled corn from Farmer Dave’s. Other appetizers include the crispy Korean BBQ ribs ($12); lamb meatballs ($10); and fried calamari ($11). The grilled half pound filet mignon ($28) is reasonably priced and delicious. When I tried it, the eight-ounce filet was tender and cooked just as I ordered. It was accompanied by a flavorful port wine demi-glace, a delightful mix of multicolored carrots, red wine braised mushrooms, and a colossal scoop of mashed Yukon Gold potatoes. Other entrees on the dinner menu include chicken and waffles ($19), which are served with garlic wilted baby spinach, red-eye gravy, and Mimi’s pepper jelly drizzle (his grandmother’s recipe); the braised boneless short rib entrée ($26) with port cranberry roasted butternut squash (from Farmer Dave’s, of course); vegetable red curry ($18), which features house-made red curry sauce, broccoli, butternut squash, baby spinach, coconut rice, and cucumber kimchi; and the half-pound lamb burger ($17) topped with applewood bacon, feta-olive relish, and served with house-cut fries or salad (the fries at Fuse are house-cut and tossed in salt and rosemary that’s grown outside). I’m looking forward to sampling more from the menu soon: thus far, everything I’ve tasted has left me wanting to come back for more. Fuse Westford, 2 Powers Road, Westford; 978-392-3636, www.fusebistro.com/westford. The interior décor is farmhouse industrial chic, and the atmosphere is calm, cozy, and quiet. Emily Sweeney can be reached at emily.sweeney@globe.com.